I have to admit - I was never a fan of poetry. In the words of my students, I just didn't "get it." That all changed my junior year of high school. I had what in most of my classmates' minds was the toughest teacher in the school. She certainly wasn't "warm and fuzzy," but she pushed us and challenged us. I fell in love with poetry in her class because she was able to open my mind to it. Sign of a great teacher. When I told my students that we will complete a unit on poetry this year, there were groans aplenty. That just wouldn't do for me - so I worked to create a poetry unit that they would be excited about. We started out reading a lot of funny poems (Shel Silverstein was a favorite), but we also read a lot of classic poems by Emily Dickinson, Robert Frost, and Langston Hughes. The Langston Hughes poems worked SO well since we were studying the Harlem Renaissance in social studies. Cross-curriculum instruction at its best! I taught them the parts of a poem and rhyme schemes, and we had poetry readings - snaps and all! Lots of fun was had by all, but I just wanted them to go a little deeper. Since I only fell in love with poetry once I was able to fully understand it, I had to teach my students to do the same. Cue annotation. I think as teachers of elementary students, we are often a little apprehensive to introduce concepts like "annotation" because they are still young and you just never know how students will perceive a difficult concepts. They ALWAYS manage to surprise me! 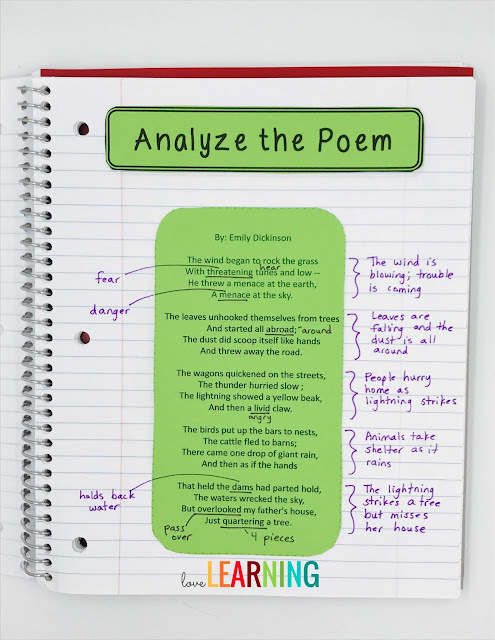 To teach annotation, I introduced the poem, The Wind Began to Rock the Grass by Emily Dickinson. The students read the poem to themselves, and then I read it out loud to them. Of course, when I asked them what they thought the poem was about - many were unsure. I told them that we are going to annotate the poem, gave them the definition, and then we dived right in. 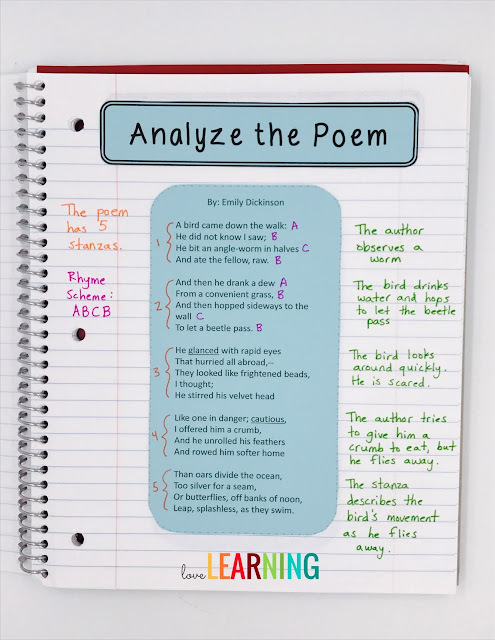 I read the poem stanza by stanza again, but this time we defined words, asked questions, and made comments on the left hand side. On the right side of each stanza, we wrote a one sentence summary. As we defined words, we talked through the words and used context clues. It's amazing how intuitive fifth graders are. They can always figure out the meaning of a word (even though they don't always believe in themselves). We worked through the first three stanzas together, and then I let them complete the last two on their own. As you may guess, they excitement began to build as the poem drew to a close. The light bulbs went off, the choirs began to sing, the end of the tunnel was in sight...you get the idea. Students were SO EXCITED about the fact that they now understood the poem so clearly! This certainly ended up being one of those "it worked!" lessons. Here is another example with the poem, A Bird Came Down by Emily Dickinson. 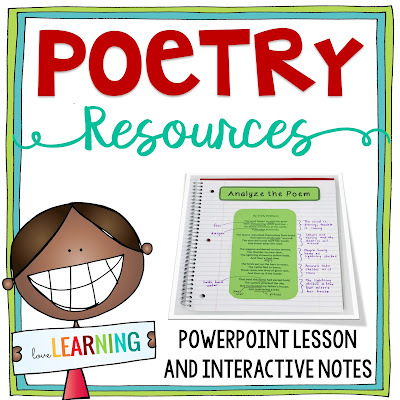 I use a PowerPoint Lesson and Interactive Notes to teach this entire unit. The lesson teaches students how to annotate slide by slide!